The UK researchers said this was a good way of communicating the health risks of moderate drinking. 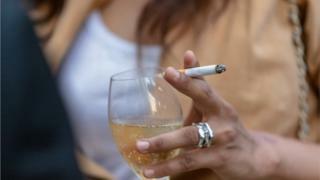 But experts said that smoking carried much greater cancer risks than alcohol, for most drinkers. And the only way to cut the risks from smoking was to quit completely. Government guidelines on alcohol consumption advise men and women to drink no more than 14 units of alcohol a week - the equivalent of six pints of average strength beer or seven glasses of wine (or a bottle and a half of wine). The guidance also says there is no "safe" level of drinking when it comes to health risk. This study says even moderate drinking can put people at risk of cancer, particularly breast cancer, which is the most common cancer in women in the UK. Writing in BMC Public Health, the researchers calculated that if 1,000 non-smoking men and 1,000 non-smoking women each drank one bottle of wine a week, around 10 extra men and 14 extra women could develop cancer during their lives. In women, alcohol intake was linked to an increased risk of breast cancer and in men, it was linked to cancers of the gastrointestinal tract and liver. For their calculations, the research team from the University of Southampton and Bangor University, used data on cancer risk from Cancer Research UK and data on the number of cancers in the population that could be linked to tobacco and alcohol. Dr Minouk Schoemaker, scientist at The Institute of Cancer Research, London, who conducts research into the causes of breast cancer, said the study offered an "interesting insight" but the picture was not simple. The study only looked at cancer - not at any other disease, such as cardiovascular or lung diseases common in smokers. It also used data from 2004 and did not take into account other factors which could cause cancers, such as age, family genes, diet and other aspects of lifestyle. As a result, for some, the jury is out on how useful the study is. Prof John Britton, director of the UK Centre for Tobacco and Alcohol Studies at the University of Nottingham, said: "I'm not sure many people decide whether to smoke or drink... based on how comparable the risks of the two are. "This study demonstrates that in relation to cancer risk, smoking is substantially more hazardous than alcohol consumption. Smoking is also far more hazardous than alcohol in relation to a range of other diseases. "If smokers are worried about their health, the best thing they can do is quit smoking. "People who consume alcohol should try to stick within the recommended guidelines of 14 units per week," Prof Britton added. But Dr Bob Patton, lecturer in clinical psychology at the University of Surrey, said the study could transform public opinion.